Shares of IBM (NYSE:IBM) declined 25.9% last year, according to data provided by S&P Global Market Intelligence. The stock hasn't done much for shareholders in recent years, as management tries to shift the company's sales mix from low-margin hardware to high-margin software and services. When concerns about a slowdown in the economy crept up in the fall, investors threw in the towel, which sent IBM shares downhill in a hurry. Things started to look up after IBM's second-quarter earnings report revealed strong revenue growth from "strategic imperatives" (cloud, mobile solutions, blockchain, security, analytics, etc. ), which increased total revenue 2% year over year on a constant currency basis. That showed improvement over growth of 1% in the fourth quarter of 2017 and flattish growth in the first quarter of 2018. IBM stock was starting to drift higher as it seemed the company was turning a corner. Then October rolled around, and things got shaky in the broader market as concerns about a potential recession were all the talk on Wall Street. IBM shares started sinking since a recession could delay corporate investment in hardware and services. Later in the month, IBM reported its third-quarter earnings, which validated the market's concerns as Big Blue reversed its previous acceleration by posting flattish revenue growth year over year (adjusted for currency). IBM is experiencing strong growth from its cloud business, where revenue grew 20% (adjusted for currency) on a trailing-12-month basis through the third quarter. But the cloud business only comprised 24% of total revenue. Meanwhile, other operating segments are not growing. As a result, one analyst said in early October that IBM's profits are in an "irreversible structural decline." Although IBM's cloud business is growing, it is way behind Amazon.com (Amazon Web Services) and Microsoft (Azure) -- the two leaders in the global cloud market. In late October, IBM announced one of the largest tech deals in U.S. history with the acquisition of Red Hat (NYSE:RHT). The $34 billion acquisition should significantly boost IBM's cloud business, but some analysts viewed the deal as a desperate attempt to catch up to larger rivals. The shares are cheap, but they are cheap for a reason. Expectations are about as low as they can get, with analysts expecting Big Blue to grow earnings only 0.96% annually over the next five years. 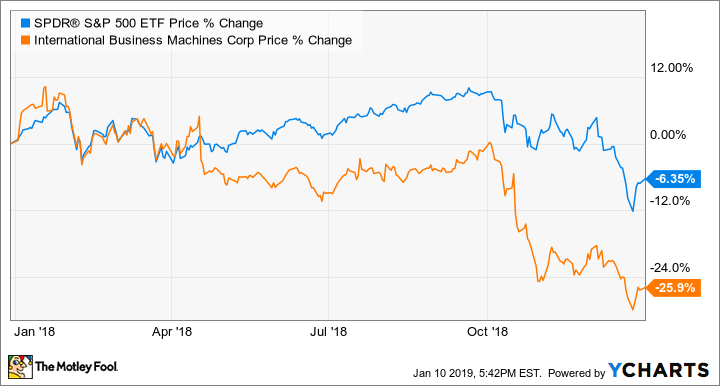 As a consolation, IBM stock offers a generous dividend yield of 5.52%, and as my colleague Timothy Green points out, it's not going to take much good news to send the shares higher from here.